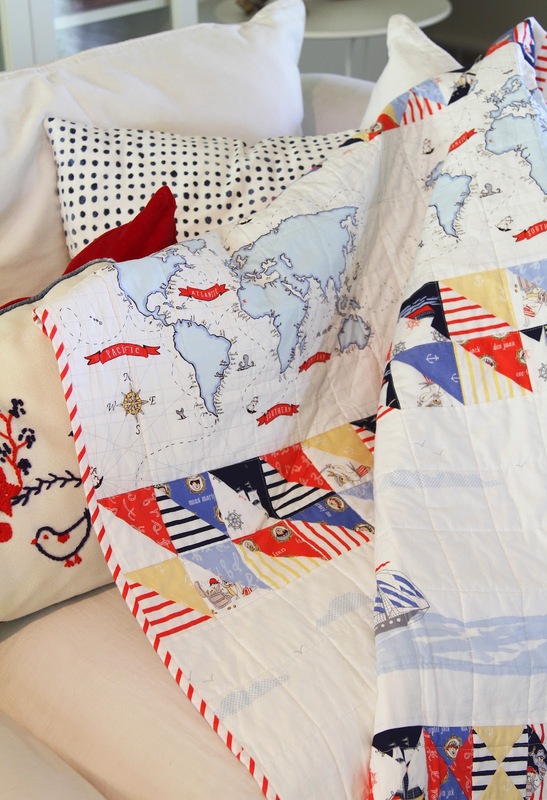 Sarah Jane’s latest collection, Out to Sea, has hit the stores. Remember this quilt from Market last spring? 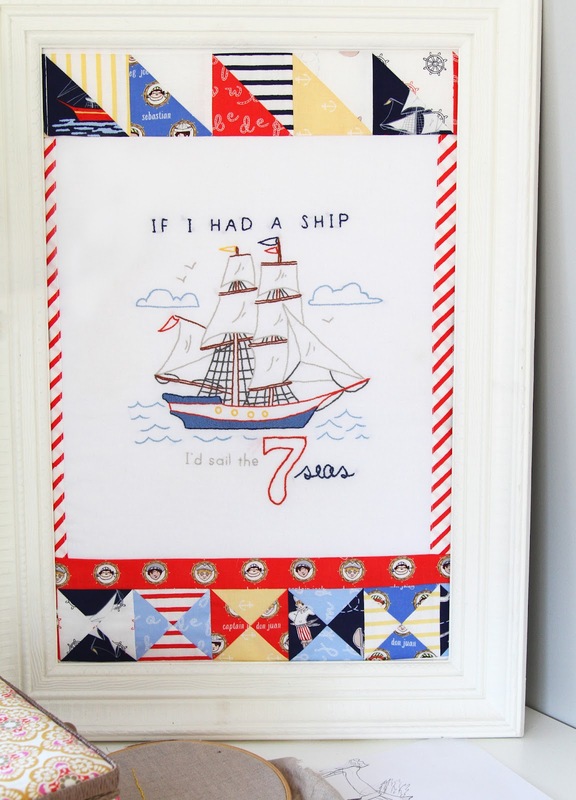 Today I am sharing a pattern/tutorial to make your very own as part of the Out to Sea DIY Blog Tour! Be sure to check out the adorable projects listed – cute clothes, pillows and even a narwhal head! Match up 28 sets of one ‘dark’ and one ‘light’ 4½” square. 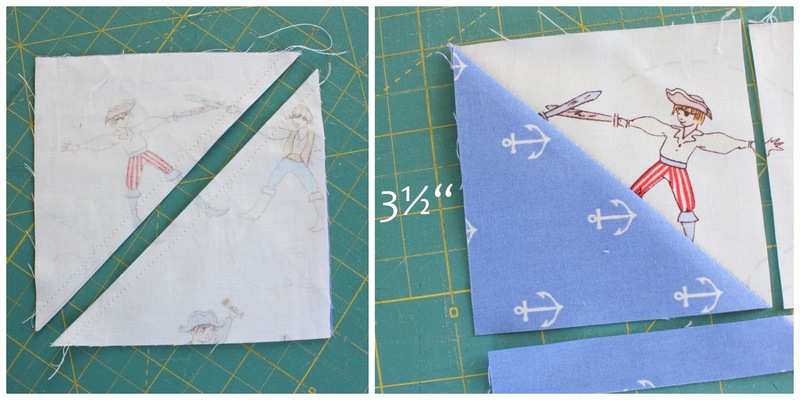 Draw a diagonal line on the back of the light square and sew a 1/4″ seam down both sides of the drawn line. Half-Square Triangle blocks: Carefully rotary cut on the drawn line and open blocks, pressing seams toward the dark fabric. You will now have 56 half-square-triangle (HST) blocks. Set aside 14 ‘sets’ of coordinating half-square triangle blocks (28 blocks total). Square-up the remaining 28 blocks to 3½ “. Hour Glass blocks: Take the remaining 14 pairs (28 HST blocks) and rotary cut across them diagonally, perpendicular to the seams. Now match up opposing blocks and sew them back together, careful to match up the center seams. Carefully open blocks and press them flat. Then square up the 28 Hour Glass blocks to 3½”. **Be sure to keep the center point in the center of the block when squaring up. For a more in-depth tutorial on Hour Glass blocks go here. Sew 14 Hour Glass blocks in a row. Press all seams the same direction. Repeat with the remaining 14 Hour Glass blocks. Press all seams away from the pieced strips. Quilt as desired. For a quilting tutorial go here. Sew bias strips into one continuous strip. Binding tutorial here. A PDF version of this pattern/tutorial can be found HERE. Sarah Jane’s coordinating Out to Sea stitchery patterns are also available now. You could use the same block technique and any leftover bias stripe strips to create a similar wall hanging. Out to Sea fabrics can be found at the Poppy Seed Fabrics, Pink Castle Fabrics, Fat Quarter Shop, Fabric Worm, and Westwood Acres. I LOVE this! No surprise though I usually love what you do. I just ordered out to sea fabric last week to do a quilt for my newborn! I will be lucky if I can get a disappearing 9 square done and try to quilt on my machine for 1st time. I have always hand quilted. Holy Smokes!!!! This quilt is FUN and FANTASTIC!!! Thank you for the tutorial!!!!! I can not begin to tell you how much I adore this quilt. It is perfection! Beautiful job, as always! thanks mucho for posting, its fabulous!!! Amy, thank you so much for sharing the tutorial. It is very gracious and thoughtful. Because for some of us once the fabric was purchased there wasn&#39;t enough left to purchase a pattern! Again,thank you so very much :D.
So cute as always Amy! wow. 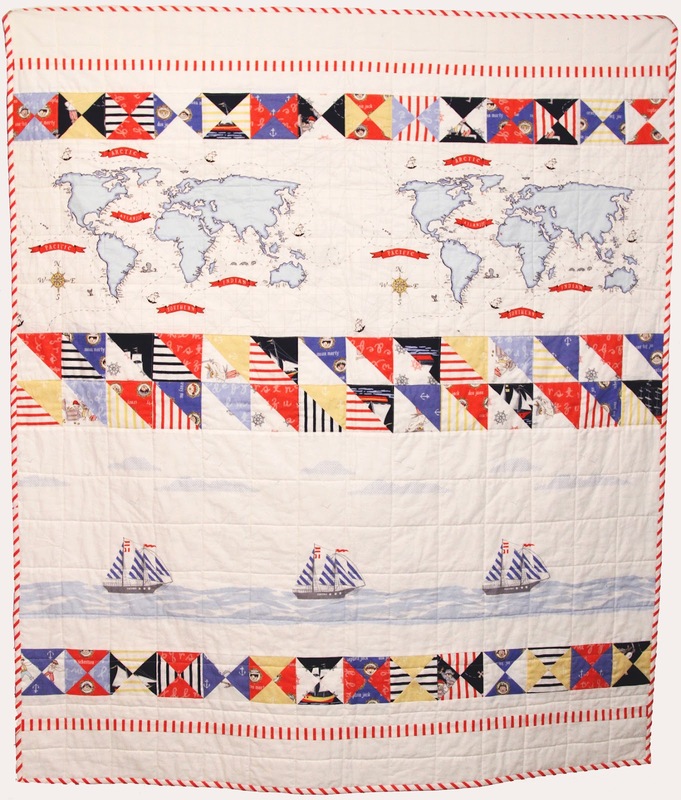 that&#39;s a very sailorly quilt.<br />it would be a huge hit in my sailorly family<br />I may have to order fabric for that! I did see your reply, thank you so much! I was able to order the correct amount. It just arrived today from Fabric Worm, and I&#39;m in awe of how lovely these fabrics are! They&#39;re so silky and delicious feeling. A far cry from the Wal-Mart fabric I&#39;d bought to dip my toe into quilting. I&#39;m almost afraid to start cutting and sewing, lest my total lack of experience mess things up. I love this…I think that I will make one in honor of my father who was in the Navy during WWII. Thanks for making it, because I wouldn&#39;t have ever thought of doing it. I missed this fabric, this is crazy good !!! I love it!! !